Since the publication of his novel Pamela; or Virtue Rewarded in 1740, Samuel Richardson's place in the English literary tradition has been secured. But how can that place best be described? Over the three centuries since embarking on his printing career the 'divine' novelist has been variously understood as moral crusader, advocate for women, pioneer of the realist novel and print innovator. Situating Richardson's work within these social, intellectual and material contexts, this new volume of essays identifies his centrality to the emergence of the novel, the self-help book, and the idea of the professional author, as well as his influence on the development of the modern English language, the capitalist economy, and gendered, medicalized, urban, and national identities. 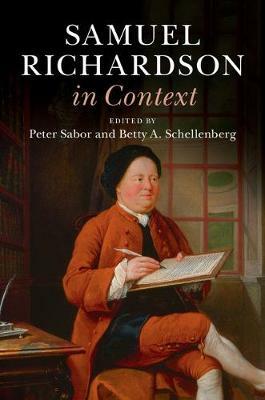 This book enables a fuller understanding and appreciation of Richardson's life, work and legacy, and points the way for future studies of one of English literature's most celebrated novelists.